Every day we receive requests for help in obtaining copies of Dominican birth records. Birth certificates are most commonly required when applying for a new passport, but many of our clients order birth certificates of loved ones and deceased family members in order to stake a claim on an inheritance. Our clerks often travel the entire length and breadth of the Dominican Republic, searching archives and ledgers in churches, courts and Dominican registry offices. Where are Dominican birth records located? These days we obtain most birth certificates from local registry offices around the country. Since 1945 Dominican birth records have been recorded in two identical birth ledgers in local registry offices: one stays in the local registry office, and the other is sent to the Central registry office in Santo Domingo for safe-keeping at the end of the year. The ledgers that remain in the local registry office sometimes fall into disrepair, and often the local registry offices have to refer to the duplicate birth ledgers in Santo Domingo before certificates can be issued. We regularly turn to churches, who have long kept detailed birth and baptism records of their congregations. Generally Dominican church records are well looked-after, often indexed, and the church staff are always a pleasure to deal with. The General Archive of the Nation in Santo Domingo has a huge collection of old disparate records of all types including birth, death and marriage records, old shipping manifests. They hold some old birth registers which are not available elsewhere. Since your boyfriend is an adult, and his birth is being declared years after the event, the entire process may take 6 months to one year. 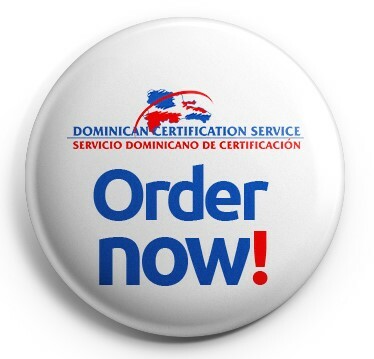 The Dominican Certification Service is a private professional service and is not in any way associated with any Dominican government department.